Reverse Logistics has grown to become one of the most important aspects of supply chain management. Here the top two entries were Hutchinson 3G – Three and ASOS with Clipper Logistics. The entry from Three, the mobile network, focuses on a new way of recycling old mobiles that have been forgotten in drawers. The company has invited customers to ‘Give their phone to a new home’ through donating their old smartphone to someone who is missing out on the online world. Three is working with a number of charities to donate the handsets to less advantaged people all over the UK, and offering them three months of free network use. 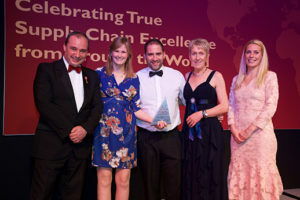 The judges appreciated the considerable merit of the scheme and liked the way that the company was closely aligned with its recycling supply partner GSUK in processing all of the handsets donated through the ‘Reconnected’ initiative. The judges also liked the way old accessories, such as recycled chargers and USB cord, were being put to good use and the fact that any donations that cannot be used due to software incompatibility, damage and/ or lack of internet access are recycled with any funds raised going towards the Reconnected programme. This was a very worthy entry, however, it fell just short of winning the category. From left to right: Richard Wilding, Chair of Supply Chain Strategy, Cranfield and Chairman of CILT, Alison Dawson Head of Returns, ASOS, Darren Cottrell, ASOS, Operations Manager, Clipper Logistics, Helen Beioley, Operations Director, Clipper Logistics, and Sara Pascoe. ASOS, one of the UK’s leading fashion retailers, has a huge online demand – receiving hundreds of thousands of UK orders every week. Consequently, the number of returns is proportionately large too. Returns partner, Clipper Logistics, has introduced an innovative returns solution, Boomerang™, designed to remove the complex barriers preventing the quick turnaround of returned products to inventory. Collaborative working between the two organisations has created a solution for returned high value bridal items. Returns are received at Clipper Logistics’ Selby facility, where a designated climate-controlled space is used to check and process these delicate garments. The judges were impressed with the high percentage of ‘faulty’ bridal wear returns that are now salvaged – a significant financial benefit to ASOS, given the high value nature of the products. The speed with which items were processed and returned to stock inventory for resale was impressive too. And the judges could see that there were benefits for customers returning the items through faster refunds. For the judges this was the winner, and so, the trophy for Supply Chain Excellence in Reverse Logistics was awarded to ASOS with Clipper Logistics.